What About My Added Words? 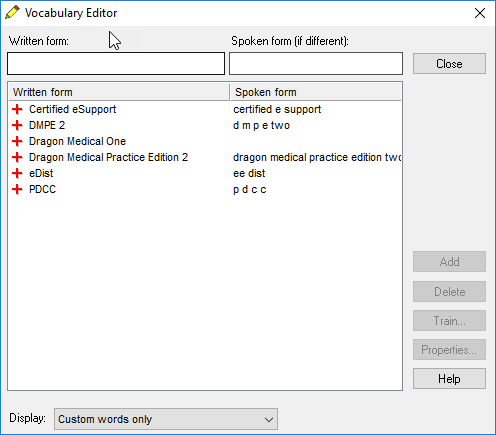 One of the best ways to improve the accuracy of your Dragon voice recognition software is to add new words to your vocabulary. In cases where Dragon doesn’t know a word yet, this is always the first step to take. For those of you who rely on this functionality for Dragon dictation—and have added many custom words—you should be backing them up on a regular basis. That way, you can recover them if your profile ever goes bad, and you can move them from one Dragon profile to another. Today, we’re going to talk about a scenario where you don’t have a backup copy of these words, and you cannot open your profile. 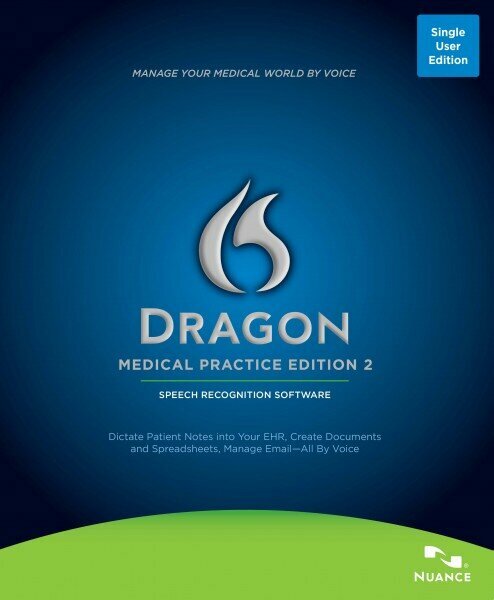 In order for this procedure to work, you will still need access to your Dragon speech profile; otherwise, you cannot recover your words. There are two main reasons why your profile might not open. Before you attempt this procedure, you might be able to recover your words through other means. In certain cases, your Dragon voice profile can become corrupted. When this happens, you usually have a backup that was saved automatically. Instead of starting over, you can restore your profile. Any custom words that were saved in that backup will be available after the restore procedure. Sometimes, your speech recognition profile won’t upgrade when you upgrade from one version of Dragon to another. 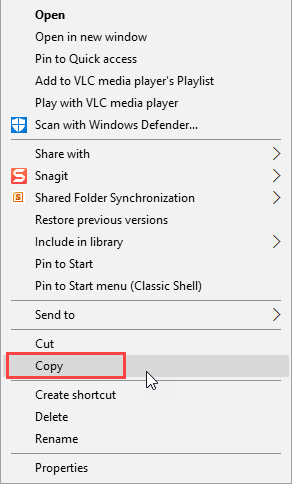 If you still have the old version of Dragon installed somewhere, you can copy your profile to that computer, import it into Dragon, and then export your custom words. From there, you would then import the custom words into your new profile. All of the functionality we’re discussing in today’s exercise refers to a specific Dragon version, on a supported operating system. We have only tested this procedure in the particular environment below. This procedure overwrites your existing vocabulary. If you already started adding custom words to a new profile, these steps will erase them. The vocabulary that has your custom words and the new vocabulary must be the same. So if you had a “General Medical” vocabulary before, you need to have a “General Medical” vocabulary in your new profile. 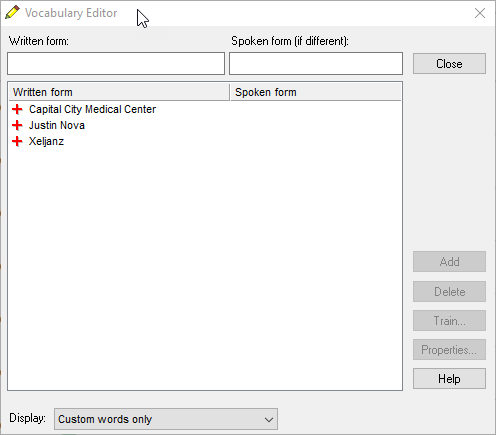 Any custom words you have added in the past were assigned to a particular vocabulary. 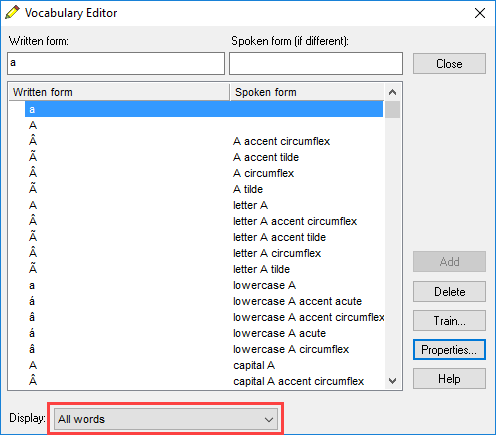 If you have multiple vocabularies with custom words in them, you will need to perform these steps for each one. The procedure for copying vocabularies between local profiles and roaming profiles is slightly different. We’re going to show you both. We have not tested copying a vocabulary from a local to a roaming profile, or vice versa. That procedure is outside of the scope of this article. We’re going to be working with a new profile named “Dr Nova 2,” using a General Medical vocabulary to match the vocabulary of the old profile. Notice that this new profile does not have any custom words in it yet. 1) Exit the Dragon speech-to-text software. 2) Find the folder containing your profile. If you exported it to another location, open the folder there. If you did not, it should be located in your Program Data directory. To get there, open File Explorer. Copy and paste this location into the address bar. Then, press [Enter]. 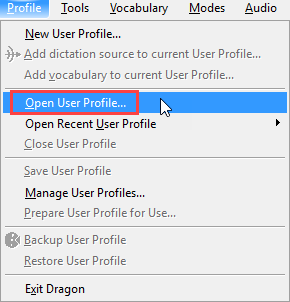 3) Open the folder of your old Dragon profile, which is called “Dr Justin Nova_Local” in our example. 4) Open the current folder and find your vocabulary folder. It should be located at the top of the window, and its name should be the first eight characters of your vocabulary. Any spaces are replaced with underbars. Disregard the folder that has “_container” in the name. In this example, the folder “General_” represents a “General Medical” vocabulary. 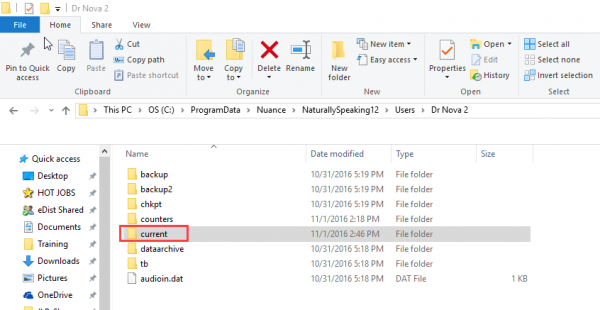 6) In File Explorer, go back to C:\ProgramData\Nuance\NaturallySpeaking12\Users. Like before, you can paste this location into the address bar. Open the new profile you created—which would be “Dr Nova 2” in this case. 7) Open the current folder again. 9) A window will pop up telling you that the “destination has X files with the same names.” Click “Replace the files in the destination.” Your vocabulary will copy over. 11) From the DragonBar, click on Profile > Open User Profile. 12) Choose your new profile (“Dr Nova 2”) and click [Open]. 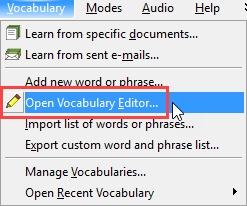 13) Once your new profile opens completely, click Vocabulary > Open Vocabulary Editor. 15) You should now see the three words we copied over from the old Dragon profile (listed in step 10). 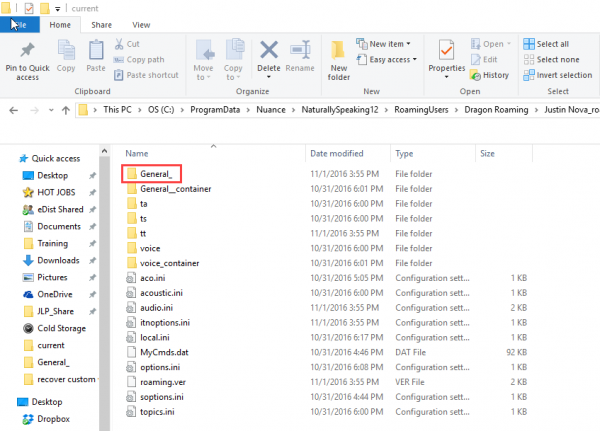 The main difference between copying local vocabularies and roaming vocabularies is in the folder locations. But, there are a few major caveats that we need to warn you about—in addition to the ones already mentioned. 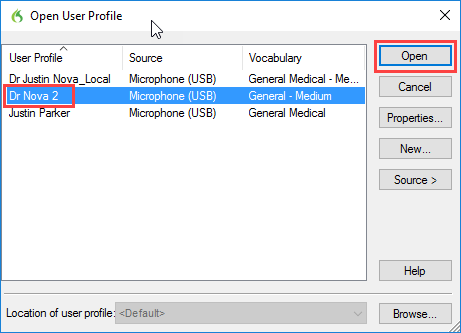 In order to transfer vocabulary between roaming profiles, you will need to have opened both the old and new profiles on your computer at least once. The procedure we will be outlining is the only method we have tested successfully. It relies on the local cache copy of the roaming profile. If you do not have these copies for both the old and new profile, you won’t be able to follow these steps. Copying vocabulary folders in these scenarios failed every time we tested them: local cache to master roaming, master roaming to local cache, master roaming to master roaming. We will be relying on a copy from local cache to local cache. 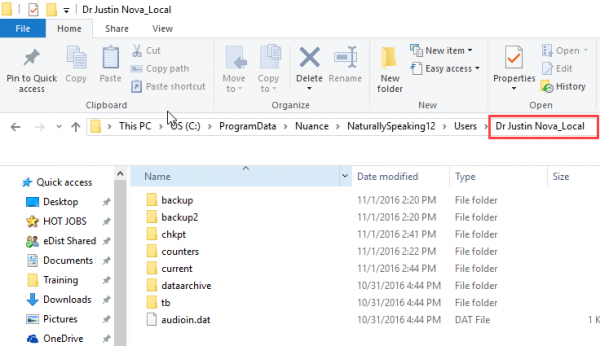 1) Open File Explorer and go to C:\ProgramData\Nuance\NaturallySpeaking12\RoamingUsers. 2) Your local roaming directory should be located here. In this case, ours is called “Dragon Roaming.” Open the folder. 3) Open the old profile folder (“Justin Nova_roaming”), and then open the current folder. 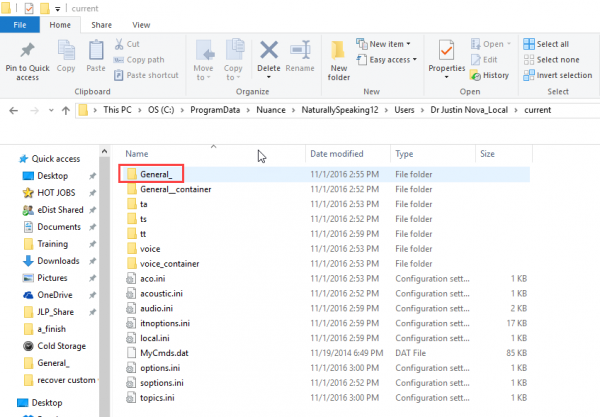 4) Copy the “General_” folder. 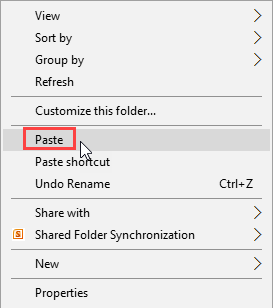 6) Open the current folder and paste the copied “General_” folder. 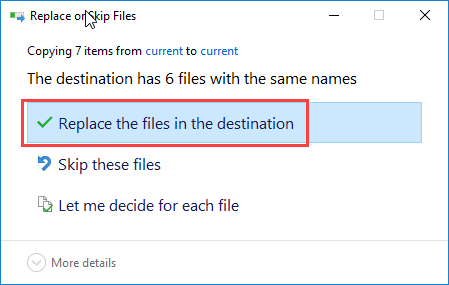 Be sure to click “Replace the files in the destination” when prompted. 7) Close File Explorer and open Dragon. Open your new roaming profile (“Dr Nova 2_roaming”). Your custom words should have transferred. 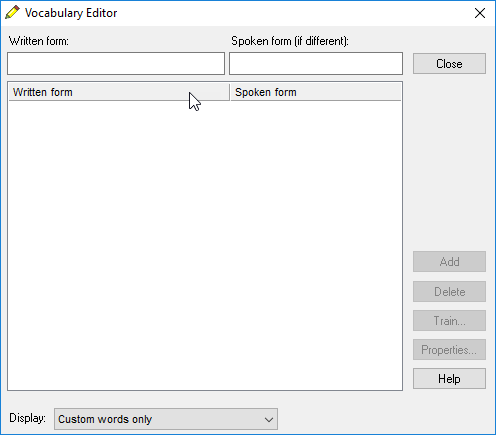 Need Help Moving Your Custom Words? If you weren’t able to complete the procedure(s) above successfully, we’d love to help you out. We have a one-hour service called Assist Me that would be perfect for this sort of procedure. For more details, check our technical services page by clicking the button below.